It’s just one week now until the Baufritz construction team start assembling our eagerly anticipated low carbon timber framed house and guest accommodation here in Lewes. 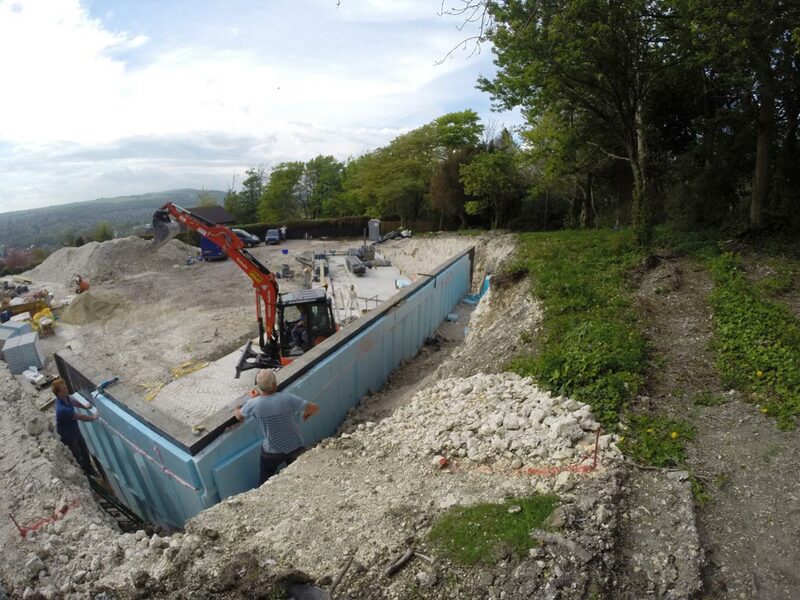 The Sky House Sussex site was humming with activity today as the finishing touches to the slab (damp coursing and extra thick ground level insulation) were made by Joe and his team. It’s wonderful to see the foundations of the house are now fully joined to the chalk ground in which they are cradled. A geothermal energy-efficient marriage made in construction heaven, we hope! These photos show how the gap between the back wall of the house and the chalk escarpment has been in-filled with some of the excavated chalk, so the ground floor of the house is now truly earth-sheltered. This was painstaking repetitive work, requiring picking up and dropping down just small scoops of chalk at a time. Look how the wild bluebells growing up on the pile of excavated chalk to the left of the Sky House driveway match the colour of the sky. New growth, new life, new house-is-a-coming!